Casino Cruise is relatively new on the market, being launched in 2014. It holds a gambling license from the Maltese authorities. 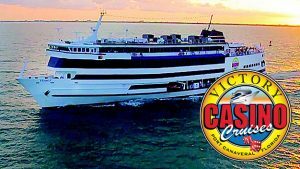 Despite being a new name on the on-line casino market, Casino Cruise has gained a lot of attention due to its quality website and overall offer. The great images, graphics and colors that you will notice the first time you visit the website will directly draw you into the cruise Ship scenario the website is built upon. The casino really takes its players into a great adventure during their stay. In the lobby area it is displayed a great range of exciting games. They come in a big number, over 600 and cover almost all the areas of a casino: scratch cards, keno, video slots, video poker, classic slots, table games and live casino. Either if you enjoy playing blackjack, poker pursuit, Spanish 21 blackjack, cyber stud poker, baccarat or roulette, Casino Cruise is the place where you will find every game you can think of. The games provides are top names in the industry: NYX Interactive, VIVO Gaming, Net Entertainment, Microgaming, Play’n Go, all being operated by OddsMatrix and Every Matrix. From October 2015, the cruise ship has introduced the new live casino from Evolution Gaming. Players can place their bets on blackjack, roulette or casino poker from the comfort of their homes, while enjoying the professionalism of the best dealers on the planet directly from their web browser. You are certainly welcomed on board with a wide variety of bonuses and promotions. The first offer that draws attention is the £1000 welcome bonus, and the 100 free spins. It is spread over the first four deposits: 2x £200, then 2x £300, with the following match percentage: 100%, 50%, 25% and 25%. The free spins are available over 5 consecutive days. The bonus cash have to be wagered 40x times in a two weeks time span, before they can be withdrawn. If the conditions aren’t met, the bonus is lost. Slots, classic slots and other games have the highest percentage of wager. Casino Cruise offers the chance to win a real life cruise vacation or to take part in the loyalty program or VIP Lounge. For each £10 you bet, you get 1 Cash Point. 100 Cash points are rewarded with £1. The VIP Lounge from the Upper Decks include many tempting prizes like weekly cashback, gifts, promotions and faster withdrawals. The website works on any Android or iOS mobile device or tablet. The majority of games are available to play in the mobile mode, together with the live casino games, available 24/7. In addition, every newly launched game with a bonus or promotion is available from your mobile phone or tablet. Deposit and withdrawal is possible with all the classic and new methods. Visa, Credit or Debit Card, Maestro, Euteller, Giropay, iDeal, Neteller, Skrill, Sofortuberweisung, Trustly, UKash can be used to both deposit or withdraw. The minimum deposit and withdrawal limits are set to £10. Casino Cruise offers players the chance to bet on their own national coin, so you will find every currency on the website. The customer service offers the whole suite of contact: e-mail, live chat, phone. The live chat function is imaginatively attached to an anchor that changes its position as you scroll in the website. Players even have the option to request a call back from an assistant agent. The support for e-mail, live chat and phone is offered in many languages and is available 24/7. ‘cheddar curtain’ rivals for the agesTo remain in Division I, a school must cheap oakley sunglasses grant at least 50 percent of the cheap nfl jerseys maximum number of scholarships the NCAA allows in each sport. Alternatively, it can issue an NCAA prescribed minimum dollar amount of aid to athletes, which as of the 2009 10 school year was about $1.15 million, with at least half going to women’s sports. Reynolds bought the rights to name the series, which became the Winston Cup Series. Soon after that, Richard Petty’s Wholesale Jerseys light blue 43 car was famously sponsored by STP, an oil additive.. He would approach potential victims asking them for help, take them to his car and then render them unconscious by hitting them with a crowbar. His good looks and natural charm made it very difficult for people to be suspicious of him. So just take the points and don’t try to cheap china jerseys think about it too much. Now I’m off to cheap oakley sunglasses search wholesale jerseys for an over under on the length of this game. Your friend who appears to be calm could have anxiety. Your neighbor who is a successful doctor could have bipolar disorder. The following year, 1884, Toledo moved up to the major leagues, playing against teams such as the Baltimore Orioles, Washington Nationals and Brooklyn Atlantics as part of the American Assn. Around midseason, Walker’s younger brother, Weldy Wilberforce Walker, joined him on the team, becoming the third and final black major leaguer before Jackie Robinson.. You know all those facts you’ve learned about psychology from movies and that one guy at the party who says, “Actually .” a lot? Please forget them. Chances are none of them are true. Nike’s current dividend yield is very acceptable at 1.70%, but what’s more is that the company has been consistently raising it. The dividend has grown 13.11% in the past 5 years. Three out of four console players are boys or men under age 35. And the most popular games of the year reflect the skewed demographic. Bodies grow. Bodies shrink. Activision is launching one new franchise, Destiny. While launching a new franchise title carries greater risks than publishing established ones, we have confidence that Destiny will be a blockbuster FPS title because of the depth of development and marketing Activision has invested. What I love about ceiling features in the bedroom is the space is so limited, the ceiling feature if designed well, doesn’t take up any space but makes a big impact in a room. For wholesale jerseys a child’s room, the ceiling detail to me is essential. Hello, my name is Conan Elliott and I am director of instruction here at Camas Meadows Golf Club in Camas, Washington. Today we are going to talk about golf putting theory.